AS SEEN ON TV Catching the Most Fish Running The Most Trips Wisconsin’s #1 PROVEN Charter Fishing Leader! (A Proven Fact Indicated by Wisconsin DNR Records!) CLEAN, MODERN BOATS, AN EXPERIENCED PROFESSIONAL CREW AND A ONE OWNER BUSINESS MAKES THE DIFFERENCE! 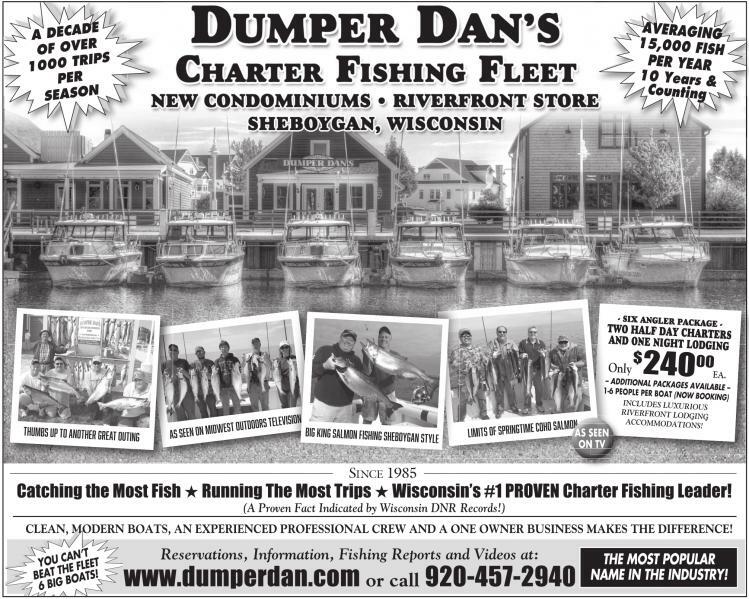 SINCE 1985 Reservations, Information, Fishing Reports and Videos at: www.dumperdan.com or call 920-457-2940 THE MOST POPULAR NAME IN THE INDUSTRY! Catching the Most Fish Running The Most Trips Wisconsin’s #1 PROVEN Charter Fishing Leader! CLEAN, MODERN BOATS, AN EXPERIENCED PROFESSIONAL CREW AND A ONE OWNER BUSINESS MAKES THE DIFFERENCE! THE MOST POPULAR NAME IN THE INDUSTRY!